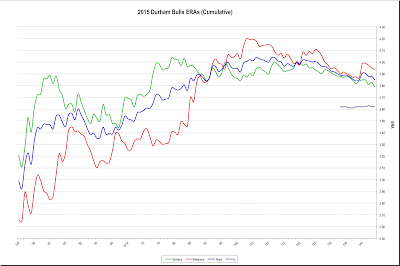 The 2015 Durham Bulls ended the year at 74-70, tied for third place in the International League South Division, four games behind the division winner, the Norfolk Tides. As the first chart shows, the Bulls peaked at 12 games above .500 back on June 15 (game 66) when they began a slide down to 7 games below .500 in mid-August. Then began a fun-to-watch climb that lasted until the end of the season. This was a season with considerable roster turmoil, mostly driven by injuries in the Tampa Bay Rays system that started in spring training and continued throughout the season. Thirty-one different players came to bat for the Bulls this year and 36 different players pitched (including a couple of position players). That compares to 21 hitters and 26 pitchers in 2014; 19 and 16 in 2013. What happened to the Bulls in mid-season? In a word, pitching. The starting pitching this year was never very good and, as a team, did not really improve. The relievers had a terrific start and showed some hope at finish, but the middle was awful. Note that these are cumulative numbers. They really should not be showing so much variance except for the above-noted roster turmoil. The end-of-year team ERA was 3.82, 11th in the 14-team International League. They did lead the league in strikeouts (1,117), but also led the league in home runs awarded (116). 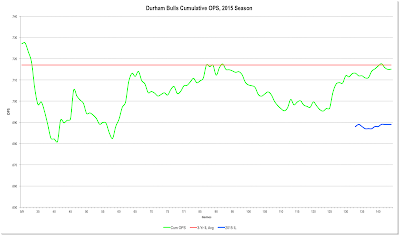 Durham Bulls hitting fell off the edge of the cliff at about the same time as the pitching. However, it recovered very nicely and, excepting a hiccup in August, ended well. [Note for stats geeks: Our interest is in team performance here and team wOBA is a pain to keep track of. Plus it follows essentially the same path this year, as far as I can tell.] 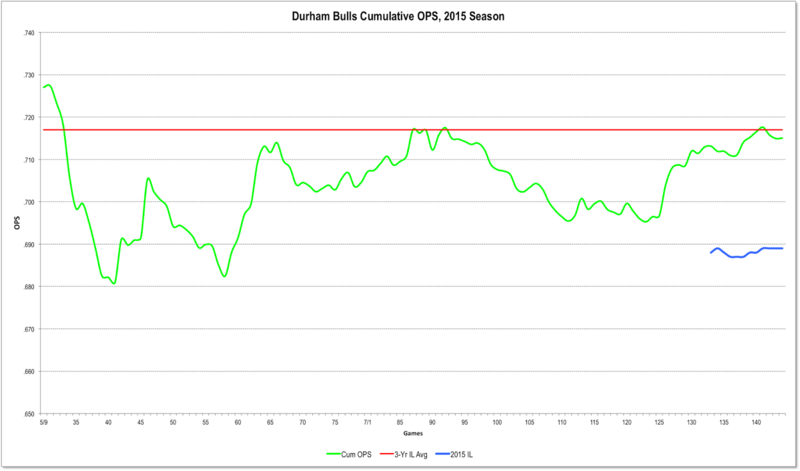 The Bulls’ team OPS was tied for third place in the International League and at .715, well above the league OPS of .689. Note also that the league as a whole wasn’t hitting all that well this year. 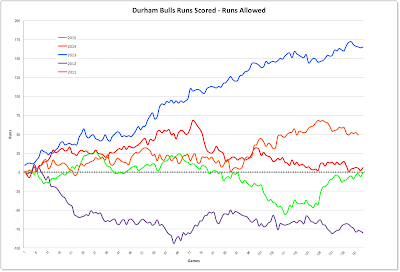 The Bulls’ 123 home runs were in second place, as were its 263 doubles. That really helped the OPS, since the team batting average (.250) was 12th in the league. My superficial impression that the Bulls were a running team was off by a good bit. 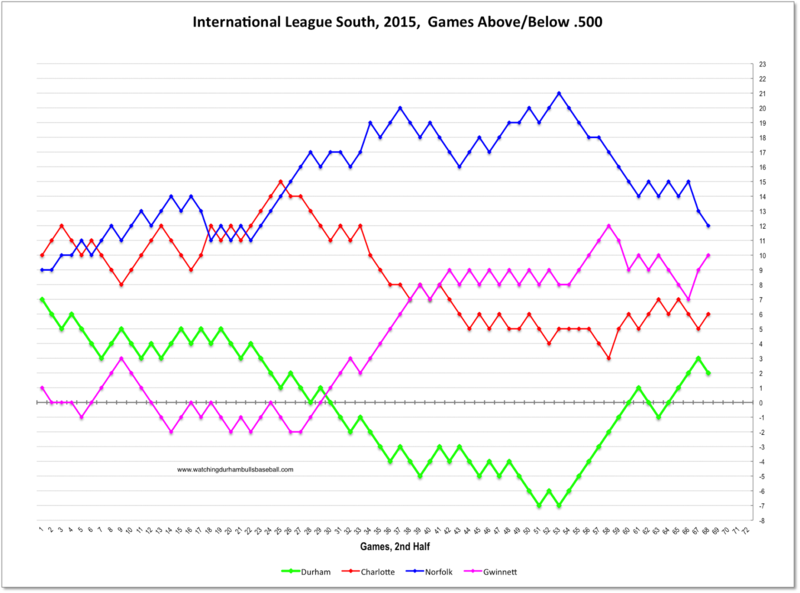 With 160 attempts (119 successful) they were well behind Indianapolis who tried 236 times (168 successful). At the end of the day, a team has to score more runs than their opponents. In 2015 the Bulls did not. 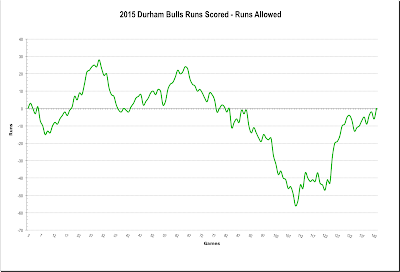 This chart is a running total of the net runs scored minus runs allowed for this year. We get the statistical quirk of ending the year at exactly zero. 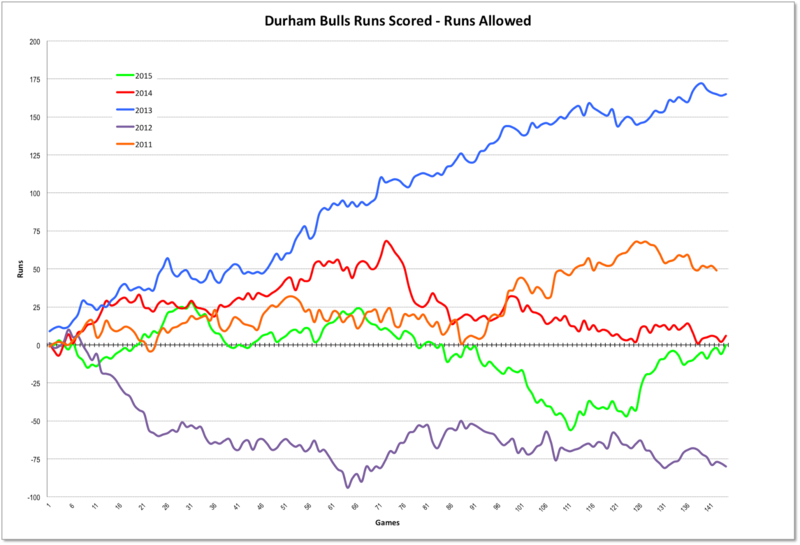 The Bulls have done worse, most notably in recent years in 2012. The oddity in this chart is last year, 2014. 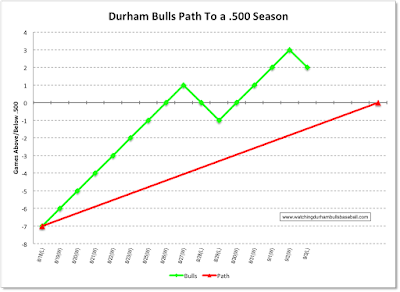 Last year the Bulls were also barely above .500 (75-69) but that was enough to win the South Division. 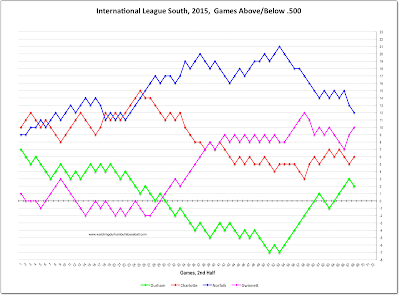 The South Division of the IL was much more competitive this year, we got to watch four very good teams go at it all year. Indianapolis and Columbus fans witnessing a terrific championship series. Every game has been decided by just one run and that run scored in the last or next to last inning. We have to point out that a lot more Columbus fans watched the two games in Columbus (more than 23,000) than the two games so far in Indianapolis (7,200). That reflects a very successful experiment by Columbus leadership to open the gates for the playoffs. Meanwhile the baseball has been a huge amount of fun for all concerned. Two very deserving teams battled each other all year are going for the championship tonight. Seems only appropriate. So far the home teams have won every game, but it has been a fight to the wire. Unless I’ve misremembered or miscounted (likely) ten Durham Bulls went “up” to the Rays this month, or just at the end of August. Six were position players and four pitchers. How are they doing? I guess that depends on your point of view. So far in September the Rays have played 11 games, won only 4 of them, losing 7. Except for the last 3, they’ve all been road games, so they really haven’t spent much time in the bandbox by (or at least near) the Bay. Of this crowd I have to say that only one of them has had much of an impact, J.P. Arencibia. And he was actually called up on August 26 and got in 5 games before the rest of the crew showed up. Among the pitchers only Andrew Bellatti has done particularly well. The rest? Not so much. Most of the numbers here are for September, unless otherwise noted. Also note that with nearly 40-players on the bench, the Rays have been doing a lot of pinch-hitching and pinch-running. Does not seem to have made much difference in the won-loss column, though. C.J. Riefenhauser: 4 games, 3.1 innings, 2 ER, no decisions. Indianapolis one win away from Governors' Cup finals. Indianapolis sweeps Scranton/WB. Update: Sep 14, still hanging out in Indy. Nice feature on Manager Dean Trainor here. 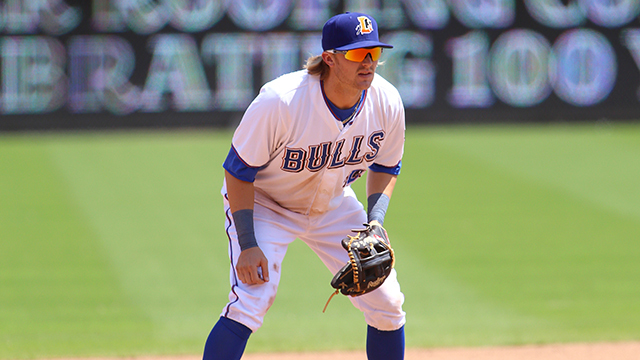 Taylor Motter finished the Bulls’ season with a bang, actually two bangs — his first two at-bats were solo home runs. And he scored the third of the Bulls’ six runs of the game when he was hit by pitch in the 6th inning and came home on Nick Franklin’s single. As we’ve remarked before, he is our favorite for a non-roster September call-up, but we admit it’s unlikely. But who am I to guess about that? Two of the guys who I didn’t think would make it (J.P. Arencibia and Luke Maile) are playing with the Rays today. New guy Jared Mortensen did a terrific job in his second AAA start. He had one of the longest outings of any Bulls pitcher this year, 7⅔ innings, and did not allow a run. Nice to see that the crowd knew how well he had done. In fact, it was a terrific end-of-season bunch there at the DBAP. We had a proposal and a tear-inducing father home from deployment moment that was shared with all of us. And then we had the battery of Dominguez (José) and Dominguez (Wilmer) to close things out. This was only the third game this year that Wilmer Dominguez has caught. I think that he has been playing essentially a Mayo Acosta role down in Montgomery this year. But he might have gotten the start because he knew Mortensen from Montgomery. He took advantage of the opportunity. He threw out Norfolk’s very quick outfielder Julio Borbon trying to steal (Borbon came in the game with 23 steals under his belt). On his first at bat he alertly took off for first base when Norfolk’s catcher could not handle the third strike, and made it. Then in his third at bat he hit a two-run single and he singled again in the 8th. Pretty good for only your second AAA game ever and only your third game this year! 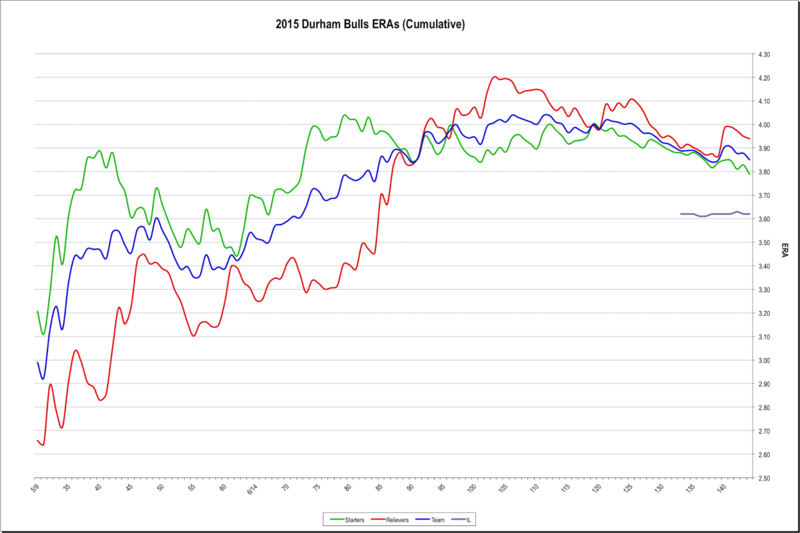 With Gwinnett’s win over Charlotte, the Bulls ended the year in a tied for third place and 4 games above .500. Considering where they were just a few weeks ago, pretty good. Things got a bit testy in the 6th. Hard to tell just why. Norfolk’s pitcher was obviously not ready for prime time and had an awful debut into AAA baseball. Maybe next year. We’re still sorting out this year’s stats and opinions. Let me know what you thought of the DBAP and this year’s team. Opening Day: April 7, 2016. Only 212 days away!!! The St. Pete Times is reporting that Nick Franklin and Andrew Bellatti were called up after the game. I don’t want to write about that first inning. Those masochists among you can get the play-by-play here. Let’s go on to something different. 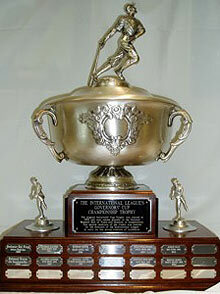 Congratulations to the Norfolk Tides for winning the South Division. They’ve had a great year and we’ve seen some good games between the two teams. Today should be fun. Yesterday saw the Triple A debut of Kyle Bird. He came up the Bowling Green Hot Rods, Rays A affiliate, to fill in for Jim Miller. Did just fine in his 1⅓ innings. The West Division championship remains undecided! Standings. Some years ago the Bulls played their last game with all players using the same bat, until it got broken. Wonder if they will do that again today? If the Gwinnett Braves beat the Charlotte Knights today, and the Bulls win, the Bulls will end the year tied with the Knights for third place. I’ve been a bit critical of the Herald-Sun this year, but Brooke Pryor’s piece on Jared Sandberg's year is a very nice job. Thanks. The Bulls started the year down in Gwinnett with the umpiring crew of Jon Byrne, Jansen Visconti, and Doug Vines. They are ending the year with the same crew. I loved this game. Two very different pitchers at work, few mistakes, pure baseball. The Bulls guy, Bradin Hagens, is a pitch-to-contact guy. By that I mean that the opposing hitters are going to get a chance. And they did last night. But they just mostly hit the ball to Bulls fielders. Hagens did not give up a single walk in his 7 innings and had only one strikeout, the last batter. He even took on some of the fielding work himself with an unassisted putout in the 2nd and fielding two comebackers in the 3rd. Stats geeks will love him as well. His Game Score was 70, one of the best by a Bull all season. To top it off, he is finishing the season with four wins in a row. The Tides guy, Chris Jones, was a bit more conventional and ended the night with 6 out of 7 innings of solid pitching, including 7 K’s with his 1 walk. If not for the 1st inning, things could have been 0-0 when both pitchers left the game. But the 1st was enough. Rehabbing Steven Sousa (broken hand) was dh-ing and batting second. He got a hit. Taylor Motter walked. Sousa scored on a Corey Brown single. Motter scored on a Cameron Seitzer single. And that was essentially it for the rest of the game. Yes, reliever Robert Zarate provided some thrills in the 9th. But a little cardio work is good after you’ve been sitting all that time. I’m liking two of the new guys a lot. The first, who’s been here a while, is Joey Rickard. Quick hands at bat. Good in the outfield. Have not seen his arm tested yet. The second is recent arrival Cameron Seitzer, who appears to be a real pro at first base, in spite of last night’s E, and a decent left handed bat. With this win (actually with Friday’s win) the Bulls are sure to finish the season above .500. Good news. 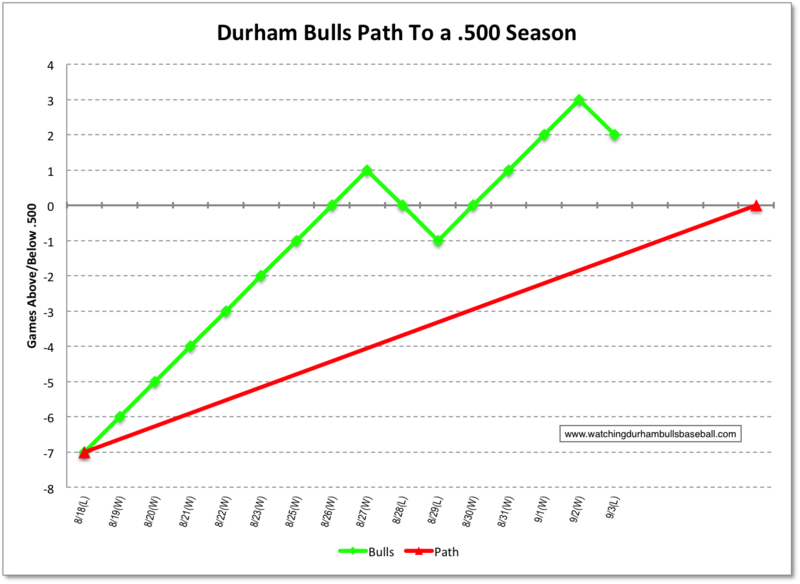 The Bulls set a new season attendance record with well over a half a million fans through the gates. Hak-Ju Lee passed through waivers and has been assigned to the Bulls. At a guess he will be in uniform either tonight or tomorrow. Not sure of the rules. Gwinnett lost to Charlotte last night, but neither the South Division championship nor third place in the division is set. Nor has the West Division championship been decided. Standings. Has Boog Powell turned into a home run hitter? He’s the guy who bunts his way on base a lot of the time and yet in the last two games he has put one over the wall. We expect it of Corey Brown, who hit a just barely fair one in the 9th for his 19th, or Taylor Motter, who’s 12th dinger in the 7th was the shot that doomed the Knights, but Powell? Things got a bit testy in the 9th when the Knight’s Wendelkin tossed a pitch behind Taylor Motter. But Wedelken got ejected and if things didn’t calm down, at least the field got cleared of excess players after some intense discussions. In the last couple of games there was a good bit of plunkin’ and near-plunkin’ goin’ on. So maybe the umps had had enough. Too many home runs? Over the three game series 15 home runs were hit, 9 by Knights, 6 by Bulls, but that seems to be the result of the Knight’s very, very pretty Little League park. By the way, after Wendelkin got ejected, his replacement walked Motter and Corey Brown followed with his home run that put the game out of reach. Have to wonder what the chatter between dugouts was after that. Meanwhile Blake Snell pitched his last minor league game of the year. With the Bulls he was 6-2 with a 1.83 ERA. He is an amazing young ballplayer. We can hope to see him for at least some of next season. The Rays have been appropriately cautious of him, limiting his pitch count and innings with the Bulls. Have to think that he will get in at least a couple of innings with the Rays before the end of this season. We also saw Ernesto Frieri for the first time since July 7th. Frieri has been on the Durham Bulls’ books since passing through waivers on June 20, appearing in only 7 games. José Dominguez, another on and off pitcher, had a rough inning. Now what? Standings. Norfolk leads Gwinnett by 2 games, they both have three games left to play. Gwinnett plays Charlotte for their last three games down in Georgia. Norfolk comes to town for three games at the DBAP. As noted, Norfolk is just 2 games ahead of Gwinnett for the South Division title. That’s a big comedown for the Tides. They had led the division by six games as recently as August 18th, but they’ve had their troubles since then. Nevertheless, Gwinnett has to win all three against the Knights, and the Tides have to lose all three against the Bulls to take them completely out. We won’t go into tie-breaker rules. Makes my head hurt. Seems to me that both Norfolk and Gwinnett are going to have to work for it. By the way, the IL West is still a dead heat between Indianapolis and Columbus. The Bulls are one game back of Charlotte. There’s a way for them to get out the cellar before the end of the year. These last three games have odd timings: 6:35, 5:00, and 1:00. Don’t be late! A pitcher, Kyle Bird, has been brought up all the way from Single A Bowling Green. Seems to be somewhat specialized for his age (22). 69Ks in 69 innings. Stats. Jim Miller was placed on the Temporarily Inactive List. Update: Reported to have become a new dad. Congrats! The game started at noon because two Carolina football teams were playing on a Thursday (!) night in downtown Charlotte (one of the teams lost). Pretty much the Bulls were cruisin’. Boog Powell was back in leadoff and had a great, great game with 4 hits (two doubles and a home run). New guys Cameron Seitzer, Alec Sole, and Wilmer Dominguez were in the lineup and did just fine, although Sole didn’t get a hit. The whole team had five doubles and a home run. They were ahead 7-3 going into the 7th. You’d think it would be enough. With the noonday sun, came a little rain, in the shape of absolutely the worst performance of the relief crew this year. Too bad, because Andrew Bellatti had seemed to be sorting himself out and new guy Parker Markel was doing just fine. But Bellatti gave up 3 homers and five runs in his time on the mound and Markel gave up another one in the hitter-friendly park. With the loss the the Bulls were officially eliminated from the South Division race. To be realistic, they'd not been in the running for along time. That was not what I’d been hoping for. What I’d like to see by the end to this season is a stable .500 record and maybe, just maybe, getting up into third place. That’s a maybe for the Bulls, but they’ve got to win, and Charlotte has to lose in a race that’s getting very tight. The South Division race is down to just a one game difference with Gwinnett having a very good shot at pushing Norfolk off the bus. To get there the Bulls will have to be the spoilers for them. Gwinnett is one game back. Gwinnett and Norfolk play tonight in Norfolk, but the key games will be the last three Bulls/Tides games in Durham and the Braves/Knights games down in Georgia. The South isn’t the only race undecided. The West Division is a dead heat. The difference there is that the second place team, whichever one it is, has a lock on a playoff spot. About playoffs from the players’ perspective: David Hall of the Virginian-Pilot has a terrific set of interviews with Tides players from a couple of days ago. Worth a read. Players, until they get on the field, aren’t big fans of minor league playoffs. MVP: Taylor Motter. You bet. He was fun to watch and did everything very, very well. Team Spirit: Jhan Mariñez. I like the choice. Terrific reliever. Expect him to be on next year's 40-man. Maybe this year's. Community Service: J.P. Arencibia. Makes sense to me. And here’s the “path” to what WDBB considers a reasonable goal for this year’s team, but they can still make it into 3rd place with some luck (and a win today). Four games left! Hang on! The new Durham Bulls kept up their late season pace last night. Only two of the new players were on the field, José Constanza in left field and Cameron Seitzer at first base. Constanza had two hits and a RBI. Seitzer had his first AAA hit. Old hands Corey Brown, Ryan Brett (who had a 4 for 5 night), Nick Franklin, Jake Elmore, plus new guy Joey Rikard contributed RBI. This was the best outing that Scott Diamond has had since back on July 6. And it was, by far, his most efficient. He went 7⅓ innings on only 87 pitches. That is a stellar 3.95 pitches per out. He was already the most efficient starter on the team at 4.90, but this was an exceptional outing. Parker Markel gave up his first run. Here’s a bit more discussion of Hak-Ju Lee. At a guess, another team is going to claim him, but my guesses aren’t usually accurate. Congratulations to Taylor Motter for making the International League All-Star team! Yet another argument for a call-up for him. He was 1 for 4 with a walk while playing shortstop last night. J.P. Arencibia made the Orioles pay for dumping him at the beginning of the season. He started at catcher last night up in Baltimore and picked up 6 RBI on two singles and a home run in an 11-2 win, while catching Drew Smyly in Smyly’s best performance since finishing his rehab with the Bulls a couple of weeks ago. And a small rant about the Herald-Sun. First, they messed up their website so I had to make several calls to get to it. Then they didn’t bother to send a reporter to last night’s game and did a cut and paste job from the Bulls wrap. I’ve come to expect that of my hometown paper, the N&O, but Durham’s? Ernesto Frieri came off the disabled list. 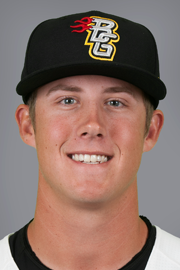 Jared Mortensen is a 27 year old Canadian right-hander who has started 17 games this season for the Montgomery Biscuits. Has been in the Rays system since 2013. Stats. Cameron Seitzer is a 25 year old mostly first baseman and designated hitter for the Biscuits the last two years. .308/.383/.475, pretty good. Stats. Alec Sole is the youngster of the crew, only 22. The infielder (ss, 3B, mostly) is jumping up from the Charlotte Stone Crabs. He started the season in Bowling Green. Stats. Wilmer Dominguez a 24 year old catcher who has been with the Rays system since 2009. He has only played in one game this year (at Montgomery), so there’s a story there. Stats. The last two of these games kept the Bulls within reach of a respectable .500 season. They did get eliminated from the wild card, but that was a bridge far, far, too far. And the Bulls’ win last night certainly put that out of reach for Gwinnett. From now on expect chaos in the lineups. From our point of view we are likely to find the candidates for this year’s Moonlight Graham awards. The awards were not granted in 2014 for reasons that escape me at the moment, surely a good reason, though. Leading candidates at the moment are: Infielder Juniel Querecuto (4 games back in late May, 12 plate appearances) and pitcher Kyle Winkler (3 appearances in mid-June, 3 innings). As mentioned earlier today, 6 Bulls have been called up and, so far, only one replacement has been announced, veteran José Constanza. We’ll see what happens next. Meanwhile, let’s make note of the work of Bradin Hagens last night. His post All-Star performance had been something of a disaster. In his first six starts after the break he had 5 losses and a no-decision. However, on August 20 he had a nice 5 inning start and a win; on Aug 26 he had another good start and went 6⅔ in a win; and then last night he went another 6⅔ for another win. So something is on track and he has made a big difference as the Bulls crawled out of that 7 games below .500 hole they’d been in. So now (and this weekend) is the time just to go out to the park and take a look at next year’s players. The first round of September call-ups were announced last night. This is going to get complicated today and over the next couple of days as we find out who's going to be filling in. All except for Luke Maile are are the Rays 40-man so nothing needs to be done there except to make room for Maile. That will probably be announced today. Worst case, for the Bulls, is for a current member of the Bulls team to be designated for assignment, which would mean that he could not play for a few days, if at all. 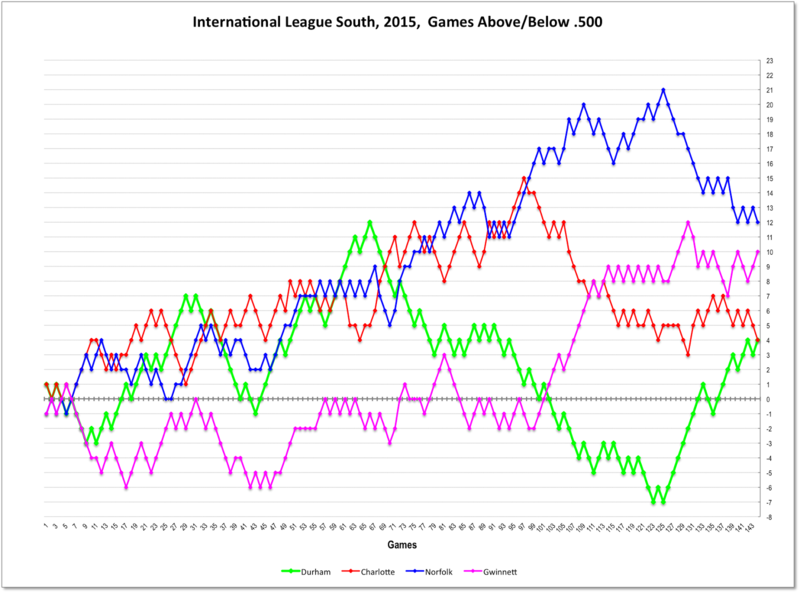 Note that the Biscuits clinched the second half win are in the Southern League playoffs. They likely will be making the case that they not get stripped of their best players. Today is José Constanza's 32nd birthday. He will be celebrating in a Bulls uniform. If the name is familiar, he spent much of last year in a Gwinnett Braves uniform and the early part of this year in a Louisville Bats uniform. Last played in mid-July. Stats. Long-time Durham Bull Justin Ruggiano is back with the team that drafted him, the LA Dodgers.